Starting on May 5th, Cricket Wireless will be selling the first no-contract handset powered by Windows 10 Mobile in the states. That would be the Microsoft Lumia 650, which will have a price tag of $129.99. With Windows 10 Mobile pre-installed, the phone is equipped with Live Tiles, Cortana, One Drive cloud storage and more. With 'Find My Phone' enabled, you can remotely ring your phone, locate it or wipe the contents if it falls into the wrong hands. And Kid's Corner allows you to hand your phone over to your kids without having to worry that they might accidentally delete the contract for the Henderson account while trying to open Angry Birds. The Microsoft Lumia 650 features a 5-inch AMOLED display with a 720 x 1280 resolution. That works out to a pixel density of 294ppi. The Snapdragon 212 chipset is under the hood carrying a quad-core 1.3GHz CPU and the Adreno 304 GPU. 1GB of RAM is inside along with 16GB of native storage. Those requiring additional memory can access the 200GB capacity microSD slot. An 8MP camera adorns the back of the unit and a 5MP selfie snapper is found on the front of the handset. A 2000mAh battery keeps the lights on. The Microsoft Lumia 650 comes to Cricket right after the AT&T pre-paid unit added a new $70 a month ($65 with auto pay) plan with unlimited data. 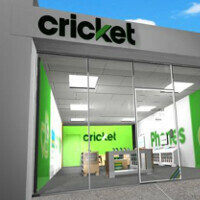 If you switch to Cricket from another carrier, you will get a $50 bill credit. Join Cricket after a stint at T-Mobile, and that bill credit is doubled to $100. Just transfer one number at the time. I wonder what they'll charge to buy the phone outright? Cricket usually jacks up the price $40-50 higher if you don't get their service.